The folks from Vignette were responsible for the concept and UX, while Superkoderi made a great job in front-end development. Covering a fragile topic of Islam in America required thorough preparations, well crafted visuals, clear website navigation and reliable back-end solutions. Drumroll, please - here it goes! The main page featuring a video trailer of Fear, Inc. documentary. 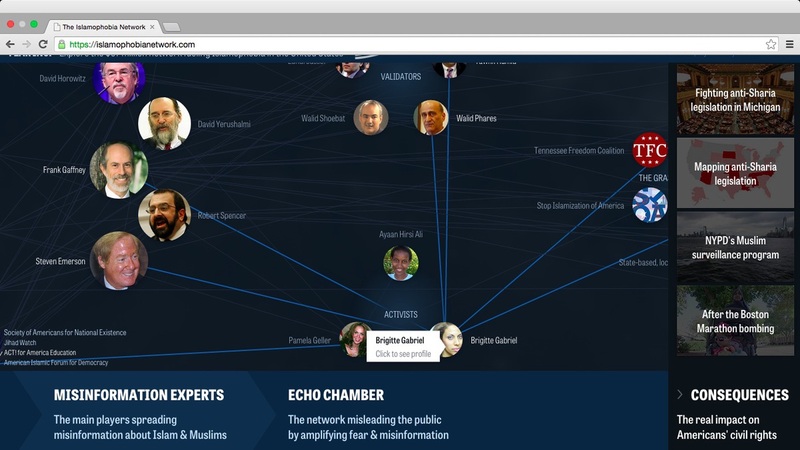 The ten-part interactive visualization shows the roots of the Islamophobia Network in America based on the investigation and successive report made by the Center for American Progress Action Fund. As an educational institute, CAP addresses the 21st century challenges the USA faces and answers them with progressive ideas and actions. Through developing new policy and challenging the media to shape the national debate, the Center’s goal is to provide all Americans with opportunities to better their lives. You can learn more about their mission and projects at the CAP website. The website lets you investigate how a complex network operates by gathering head topics into smaller subsections. 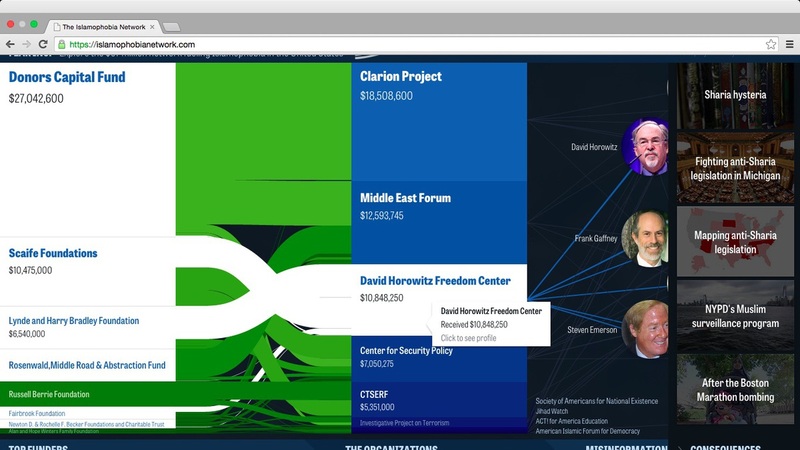 The centrepiece visualisation shows connections between the organisations, founders and money flow. Subsequently, the visitor learns how the big picture of Islamophobia flows in a complex network of vectors. The funders, organisations, scholars, grassroot activists, media amplifiers, and political validators form a grid, influencing each other and creating a narrative of Islamophobia—the prejudice against, hatred towards, or fear of the religion of Islam, Muslims, or of ethnic groups perceived to be Muslim. The neatly organized visualisation presents links between people and stages of the network. 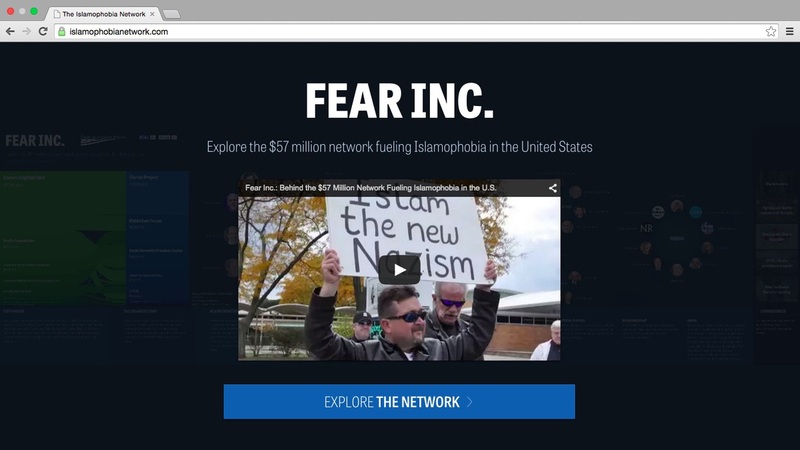 The Consequences bar located on the right completes the site's content by revealing the impact and tangible results of “fear mongering and supporting policies advocated by the Islamophobia network.” The articles form a top-down picture of the Islamophobia network affecting American politics and media. It starts from the very basics and allows users to navigate down to more detailed cases regarding particular cities. Here, users can discover more about Sharia law and its misconceptions, examples of anti-Islamic legislation, or stories of Muslims portrayed negatively in the media. The Consequences section is a visually appealing directory of articles on how the Islamophobic network influences American law, society, and media. This project required coordinating three different teams, each responsible for a different part of the project. Netguru took care of the back-end, including developer integrations with Google Analytics and Amazon s3, as well as testing coverage. Even though our team had dealt with much more elaborate tasks before, we are always thrilled to work with such a great guys from Vignette and Superkoderi. This wasn’t our first collab with these two companies—the workflow and communication ran seamlessly as always. 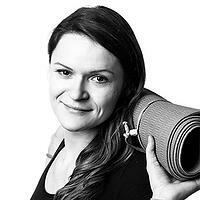 Superkoderi operates in Czech Republic, while Vignette is actually a global business. The whole project was managed and performed remotely - we know how to deal with distance, so it wasn’t an obstacle for us. We also previously worked with these teams on Stories of Change for World Press Photo, during which we faced the challenge of creating a fast-loading site with loads of visual content. You can read about the details in another blog post. “Mission accomplished” is one of our favourite phrases, and this project was no different. If you want to learn more about the project from the other side of the board, check out this post by Vignette Interactive. Interested in Project Management and showing content at its best? Have a look at our post about Stories of Change project for World Press Photo.